Ok, so I’ve went back and switched to a Flex Daily schedule. It is telling me that the scheduled run will be 6hr and 54 min (414m total)! That seems quite excessive. Especially when comparing to a fixed schedule that I create, and it waters 2x a week for 161m each time. I’ve also noticed that the next scheduled watering will be on 10/9, and I most recently watered early yesterday morning. It then will water on 10/11 for a couple more hours. I guess I’m just a bit confused as to how the overall length/timing is determined. The goal for me is to keep my lawn healthy throughout most of the year and really start to drive root depth. I want my turf to receive 1 - 1.5" of water per week total. How is the flex daily going to help me achieve this since it will only water based on the estimated soil environment for my area? Am I really missing anything other than some cool moisture graphs? 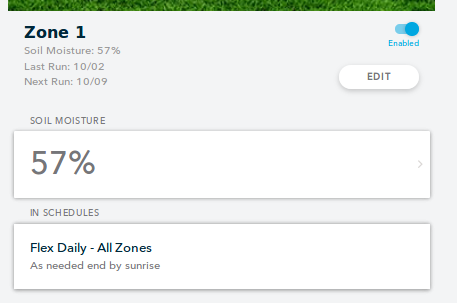 Flex daily doesn’t have a set interval so it’s difficult to compare to a fixed schedule. In some months you will water more frequently, in others less frequently. We had a few significant precipitation events in Colorado and at the end of August I didn’t water for close to two weeks. In October I’ll probably only water every 7-10 days based on the weather. The great thing is that they are dynamic. If you do feel like the duration is too much you can always dial it down. 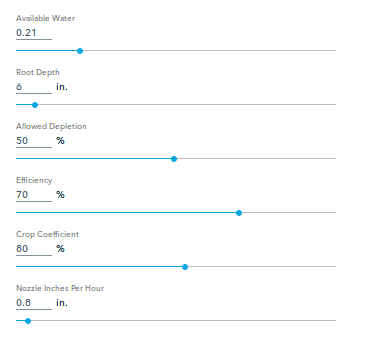 Duration is largely derived from root zone depth, nozzle type, and soil type. It looks like you’ve modified available water (derived from the soil type) and the nozzle inches per hour away from the defaults. That is one of the reasons why your durations might be a bit longer. We try to water more deep and infrequent to promote healthier, drought tolerant roots. Here is some more information on the philosophy behind flex daily. How do Flex schedules work? Due to predicted weather and your last watering your next watering will be on 10/9. It won’t water on 10/12, that is actually predicted precipitation! 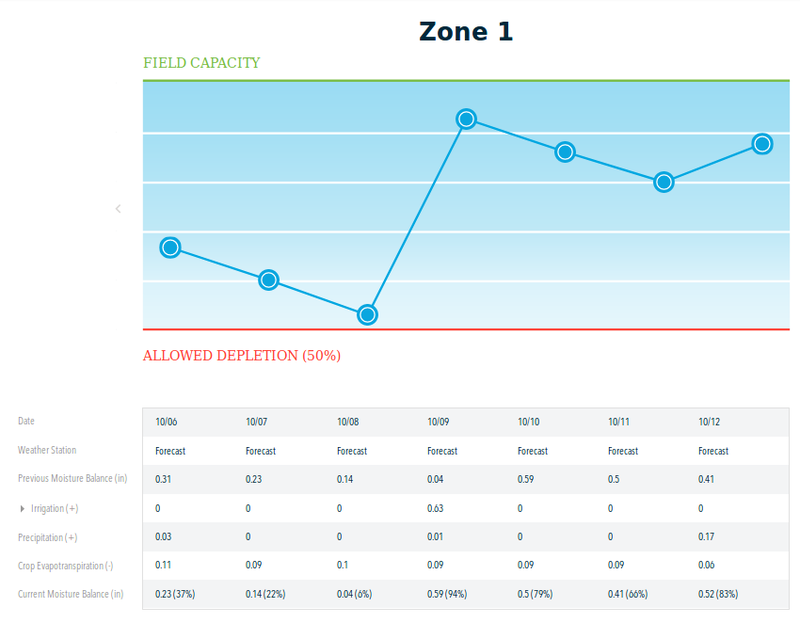 That is the beauty of flex daily scheduling, it tracks irrigation, ET, and precipitation. Precipitation fills your zone bucket up just like irrigation does. Flex daily can definitely help with this. I always recommend starting with one or two zones in flex daily to get a feel for it. Flex daily is setup to water based on root zone depth and other zone factors. According to our calculations .63 inches of water (shown on the graph) will be applied to your zone for optimum allowed depletion watering. My assumption is that in warmer months you will be watering a couple times a week (or a little more) which will get your 1-1.5 inches of irrigation. I think the true value was undersold by me (versus just a cool graph). It’s a powerful way to track real time weather (and simulated forecast weather) and monitor zones. Hope this helps, please let us know if you have further questions. that I create, and it waters 2x a week for 161m each time. The Nozzle inches per hour was modified based on a physical rain gauge test in each of my zones. The one thing that I still want to do is determine actual root depth. I will get that in the spring as I just recently overseeded and have a lot of new growth coming in. All of these questions are coming from trying to understand how the system works to make sure my lawn is getting the best watering application. Watering deeply and infrequent, as you mentioned, is also a goal of mine, as long as I’m obtaining 1 - 1.5" of water per week. I guess I was just thrown off by the 7 hour duration. Just seems like a very long time!